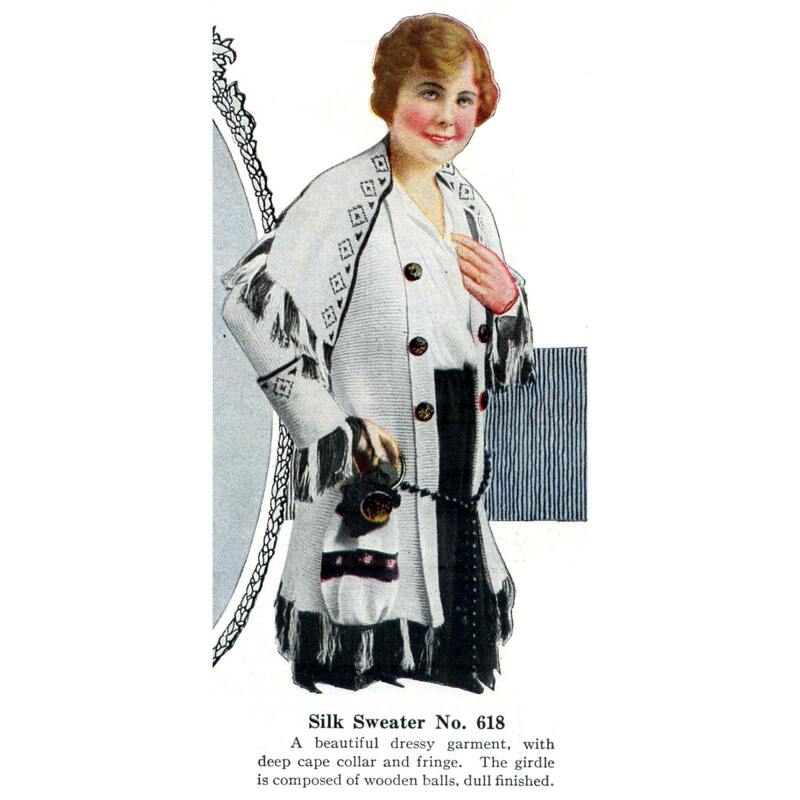 This E-pattern is for a wonderful WWI knit coat with a crocheted collar. I am also including instructions the crocheted purse that was pictured with the coat, so you get two patterns in one! This sweater pattern includes instructions for size 34-36 inch bust. 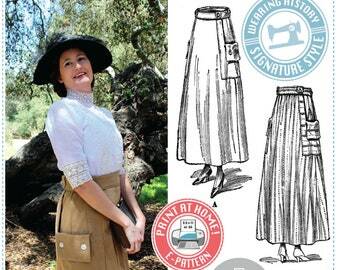 The pattern is from 1918. "A coat sweater of rare beauty is of silk in black and white. The body of the sweater is knitted, but the unusual scarf collar is crocheted and ends well down over the shoulders and has a deep fringe and row of diamond motifs in black and white; the very deep cuffs are also crocheted and are decorated in the same way. A long girdle of black wooden balls with pendants hand painted in colors and dull black hand-painted buttons to match add their own distinctive beauty to this charming model." "The bag is effective crocheted in black and white Sweater silk and matches… Through the band of black in the center rosebuds are worked at intervals in shades of pink and green. The large black button and pendant on the bottom of the bag and the buttons on the ends of the cords are hand painted to match the pendants and buttons on the sweater; the ring handles should also be black and may be hand painted if desired. The bag measures about 9 inches in length without the pendant handles." Materials required: FOR COAT- Corticelli Sweater Silk, 12 balls White No. 474, 2 balls Black No. 470. One pair No. 4 Knitting Needles. One No. 5 Crochet Hook. You will also need purchased buttons and to make or buy a belt. FOR PURSE- Corticelli Sweater Silk, 1 ball White No. 474, 1 ball Black No. 470, and a portion of a ball each of Pink No. 237, Beauty Rose No. 640, Green No. 46, and Alpine Green No. 1032.3. One No. 5 steel Crochet Hook. You will also need the rings for the handles and buttons for accents. No gauge is given. I do not know how this translates to modern yarn weights. The belt pictured would be purchased or made, as there is no instruction for making the belt. The instructions suggest painted wooden beads, which you could thread through a cord to mimic the original look. This digital pattern has been restored and remastered from original authentic period source materials and comes to you in PDF format. This e-pattern is four pages in length, including instructions, a working pattern chart for the crocheted diamond motif, and a few images of the finished garment from the original period source. I have also included the original basic knitting and crochet instruction from the period original in a separate file. Love it, and can't wait to knit it!